Two academic year-end pilot program initiatives made for a very busy and productive cap to the 2017/18 school year for both Year 44 and Year 43 cohorts. This type of “capstone” experience is often designed to encourage students to solve challenging problems and develop skills. For Pearson, the idea was to make time and space for first-year students to reflect on their experience, align with UWC and College values and help further build skills to be ready to accept greater leadership and responsibilities as “senior” students on campus. This experience, that allowed Year 44 to come together as strong individuals who are part of a group was pulled together by a Faculty and Programming team led by Heather Gross, VP, Education and Programming, and complemented by administrative staff input and volunteer assistance..
One of the most impactful activities was a grand ocean shore paddle from the Scia’new First Nation to and from the beach at Alyard Farm Park. For some students, this was their first opportunity to travel in the College’s two large Voyageur canoes, for others, it was a chance to paddle Scia’new First Nation canoes or those owned by the Victoria Canoe and Kayak Club. Both organizations graciously donated use of their canoes and safety-related equipment. 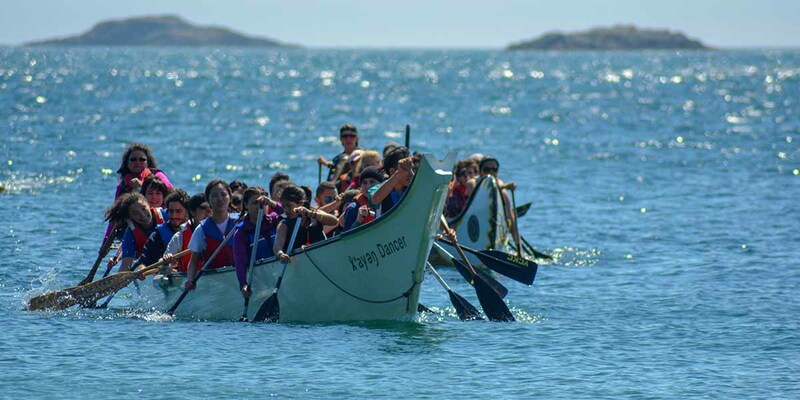 Beyond a healthy day on the water, this was a community-building and reconciliation initiative with the College’s neighbouring Indigenous community. Upon approaching the shore, the student paddlers asked permission from Chief Russ Chipps to land at Aylard Farm (part of East Sooke Park, which is on the unceded territory of the Scia’New First Nation, as is Pearson College UWC. Permission happily granted, all community members enjoyed an outdoor BBQ feast. But there was more happening that week. Sixteen students from Year 43, who graduated from Pearson this spring, also took part in the first-ever “New Alumni” Initiative held in Metchosin and Victoria. The three-day immersion was designed to send new graduates off into the world equipped with the networking and communications skills they need to sell themselves – and more importantly, their ideas and dreams – to the world. The students from all over the world stayed with host families during this time and took part in plenary and small-group workshops designed to hone their presentation skills and to put their Pearson experience into a broader context. “The students came into this pretty tired, after an intense school year, but they came out of it highly energized,” said Alumni and Engagement Officer Julia Norman, who shepherded the students on their various activities. One of the most inspiring “New Alum” sessions took place at “Fort Tectoria” in downtown Victoria when all students spent time meeting and exchanging ideas with influential members of the city’s burgeoning tech community. Several members of the group also had the opportunity to practice their personal pitches and stories in front of the assembly. As both first and second-year post-academic year initiatives were pilot programs, organizers at Pearson College UWC will take time to review and assess the success of each with an eye to making future initiatives even more impactful.